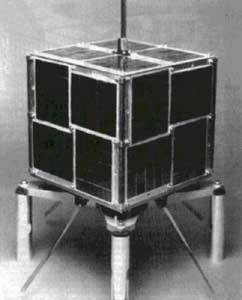 DOVE (Digital Orbiting Voice Encoder) or DO 17 (DOVE OSCAR) was an AMSAT-Brazil (BRAMSAT) amateur microsatellite. The project was initialized by radio amateur Junior Torres de Castro. It has a Digital Orbiting Voice Encoder (DOVE), designed to provide synthesised voice messages of telemetry for educational institutions. It is box shaped with dimensions of 213 × 230 × 230 mm, with solar panels on the faces of the cube and weighs 12.92 kg. DOVE was launched as on eof six secondary payloads on the first ARIANE ASAP flight V35 with SPOT-2, on the 22 January 1990 into an 780 km sun-synchronous, 98 degree inclined orbit. After a troubled life to commission the satellite, DOVE's batteries failed in March 1998. When the satellite is aligned favorably with the sun it still transmits.